‘ENTRE CHIENS & CHATS – Bonnard et l’animalité’ at the Musée Bonnard in Le Cannet. 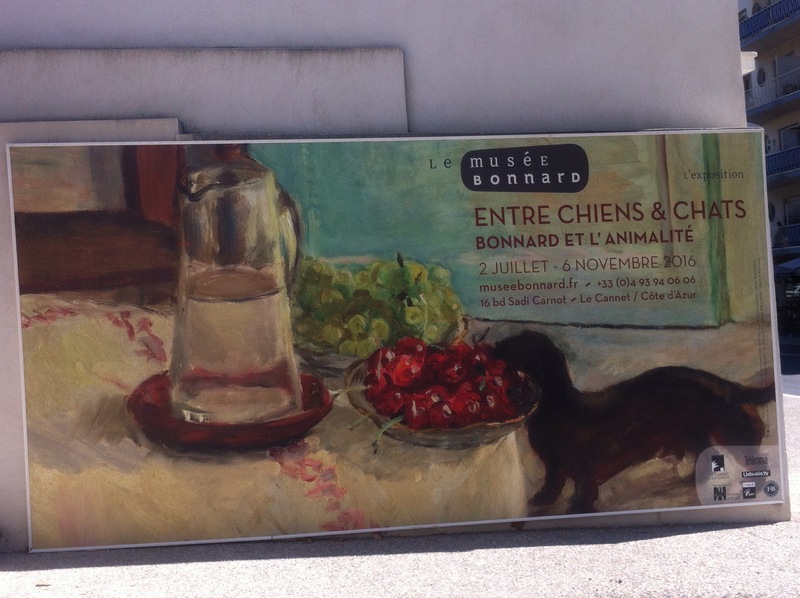 Advertising hoarding for the current exhibition ‘ENTRE CHIENS & CHATS – Bonnard et l’animalité’ at the Musée Bonnard in Le Cannet. This exhibition is one of the best I’ve seen in a long time. I was surprised at how engaging Bonnard’s work is. The curating is carefully done with great thought and works beautifully. You can’t take photographs in the the museum but hey these paintings are worth forgoing the mediation of the camera, the iPhone or otherwise. One painting in particular I would have beloved it if I’d been told it was backlit such was its luminosity – ‘Le Bouillabaisse’. The museum itself has only been open five years and it’s a must visit museum. It costs €7 per adult and a family ticket costs €14, well worth it. Now I have to find out as much as possible about Bonnard and see as many of his pictures face to face as I can. Bonnard loved Le Cannet and so will you.